Introduced at PS version 6.6.2 is support for the Macbook Pro keyboard Touch Bar. This is a strip of virtual keys replacing the mechanical function keys on a traditional keyboard. PS6 duplicates the toolbar cursor context buttons of the 3D Setup, Plaque Loading, 2D Dosimetry and Retinal Diagram windows, and the image enhancement controls of the Image window on the Touch Bar. This functionality can improve workflow on a laptop by reducing the cursor movements required in order to change the cursor funtionality. 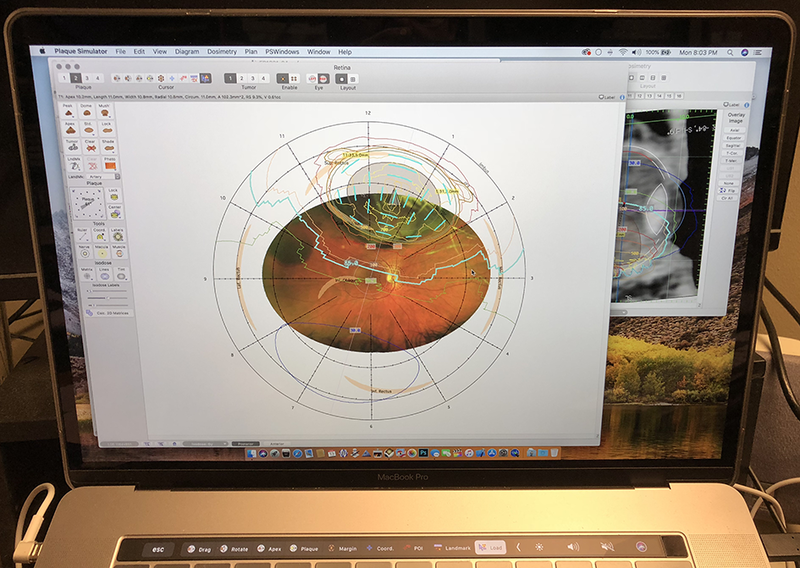 For example, when working in the Retinal Diagram window, in order to switch the cursor context from dragging the tumor to loading seeds, one only need touch the Load button on the Touch Bar. This is the Touch Bar that appears when the 2D Dosimetry window is frontmost. This is the Touch Bar that appears when the Plaque Loading window is frontmost. This is the Touch Bar that appears when the 3D Setup window is frontmost. This is the Touch Bar that appears when the Image window is frontmost.